The credit limit is a set value on your account to help manage your bill charges. It is highest amount you can owe at any time during the billing period. This amount is set based on your plan and monthly subscription. For example: From your invoice, if the Total Amount Due (including tax) adds up to $5,314.56 and your credit Limit is $6,000. This means you will only be allowed chargeable voice calls, SMS or data worth up to $685.44 (this means $6,000-$5,314.56=$685.44). Therefore, your credit limit balance would be $685.44. If you've reached your Credit Limit and you would like a temporary re-connection (Promise to Pay), contact us by clicking the Live Chat option on the screen. 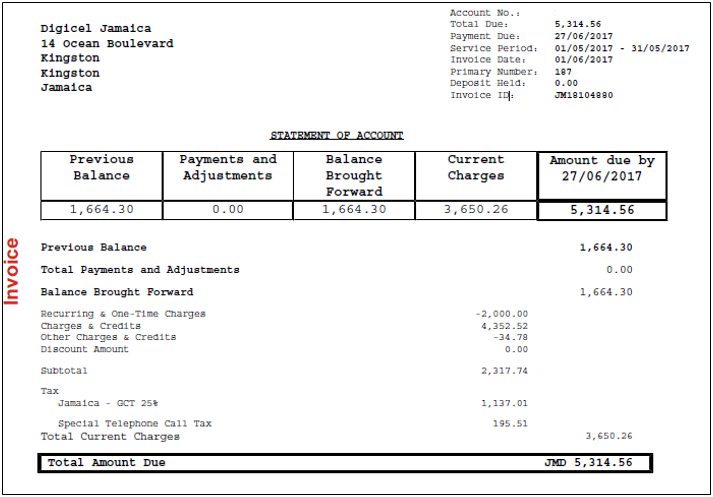 Click here to view a bill example. The maximum credit limit you can have is up to twice the amount of your deposit; this is also dependent on your plan. To increase your credit limit above the maximum value, an additional deposit along with your signature will be required. This can be done at any Digicel location.